Everything is rolling along nicely. I got the First Energy thing cleared up. We, in fact, have two meters. I know, but envy does not look good on you, so stop right now. Turns out they should’ve just moved the one from the temp pole to the house. Alas, instead, they installed a 2nd meter on the main house, leaving the temp one to fend for itself in the front yard. That explains the two bills I was getting and so forth. They did not budge on my $500 electrical bill, so alas I’ll pony up the cash for that and beg our HVAC guys to get the real furnace in place ASAP. Apparently the temp electrical furnace is not that efficient. We met our trim carpenter out at the house yesterday to discuss the nuances of the kitchen countertops. He’ll be charged with orchestrating the ballet between himself and the countertop fabricator to get the cabinets, counter and range to all align perfectly. Anyone who even remotely knows me that being off by a 1/4″ is an option. I get this trait from my mother; makes her proud. At issue here is the drool worthy possibilities that can come to fruition if all goes well. I have no idea if it’ll turn out right and look good, but we liked what we saw yesterday at the house. The base cabinets are gathering in the kitchen, awaiting their installation. Door fronts are milling about as well, but they won’t go on until the last-minute. Most importantly is the intersection of the door fronts, countertop and the range details. The door fronts will be flush with the face of the range. The counter should be 2″ thick (which is all the rage these days) and should line up perfectly with the range top as well as a perceived shadow line across the top of the range. The range will protrude forward from the countertop a couple of inches, into the kitchen. If all goes well, I should openly weep every time I enter the kitchen and feel compelled to crack open a bottle of wine in celebration. From the Wolf website, this is our range. Brilliant how it lines up with these cabinets. This is our gold standard for alignment in our kitchen. Once the range is lined up everything else should follow suit. 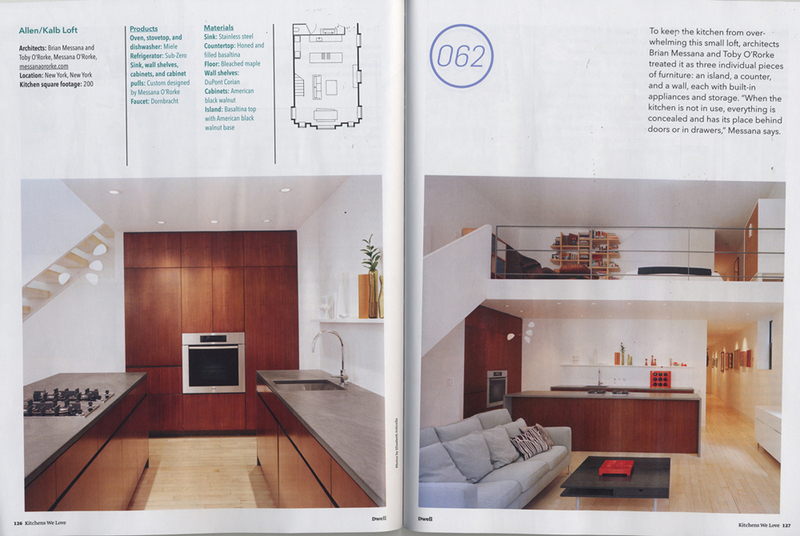 As I may have said previously, we stole our kitchen design from an issue of Dwell magazine. I really wanted to steal verbatim so to speak but as you’ll see we changed it a fair bit to make it our own. The idea is to make the kitchen cabinets look like individual pieces of furniture instead of cookie cutter kitchen cabinets. We did add wall cabinets to the recipe (I caved). And in a swift move we plugged in a tiny pantry between the freezer and range countertop. Here’s a pic from Dwell of our inspiration kitchen. Image from Dwell magazine showing the inspiration for our kitchen. In the end ours will look like a distant cousin of this one. We ended up going with laminate door fronts to save cost and to get a better color match with the dining room table. The countertops will be (knock on wood) Silestone in grey expo. My brother / expert craftsman that he is, made / is making the cabinets. Here’s a computer model I made showing you what the kitchen will look like. Nifty Wolf range CAD file from their website is cool. 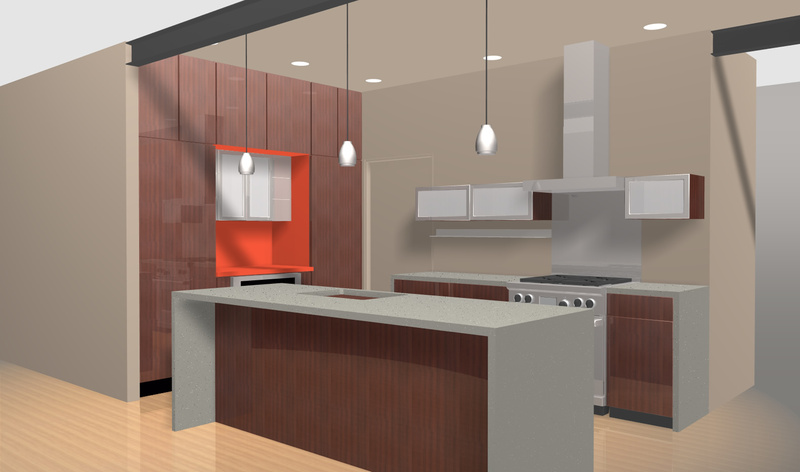 Model I made of our kitchen, compare and contrast to the Dwell kitchen we used as inspiration. No pendants by the way, they'll go over the dining room table. Additional progress, and some of my sanity restored, as well on Sunday meeting with Eric and my wife. Those two figured out what we’re doing with the fireplace. No Silestone, rather we’ll use cultured stone everywhere, right up to the EDGE60 fireplace door. We eliminated the two wing walls to provide a simpler look to the whole show. In the floor Eric’s going to try a cement hearth that is flush with the hardwood. There’s a chance it’ll crack but we’ll give it a go. Capping everything off with be the cherry mantle. We’re also having Eric paint the vanity we bought from Home Depot for the half bath. He’ll paint it satin black and we’ll distress it from there. Should be an interesting side project. Beyond that, we’re rolling along and hitting on all cylinders. Once all the cutting is done this week, we’ll get the HVAC finished up next week including our gas furnace. Today’s emergency was trying to get sizing information to the HVAC contractor so our furnace is sized correctly for the house. Not too big, not too small. Just right. This entry was posted in Construction, Cool Stuff, Design, Finish Trim and tagged building process, countertops, design, house by Chris. Bookmark the permalink.